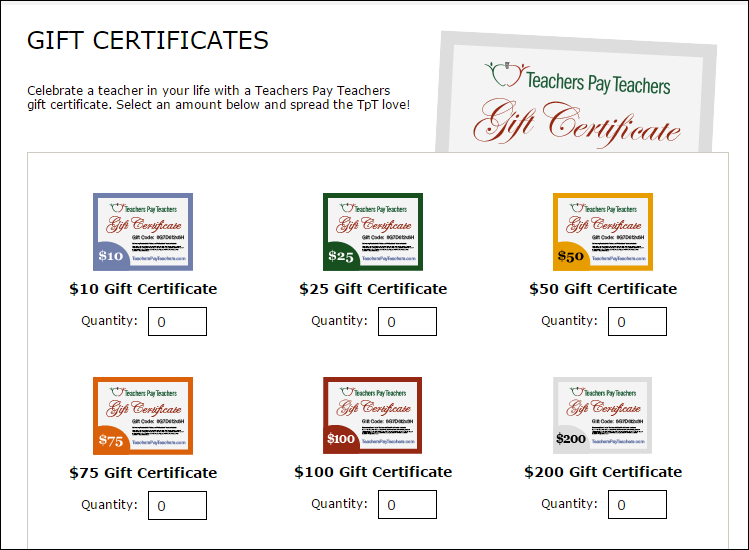 Did you know that TpT now sells gift certificates?! This has been my go to perfect, no brainer gift for other teacher friends and student teachers! I know that most of us are now on our much needed Winter Break and don't even want to think about school or working! I hope that you are able to find the time to relax and enjoy yourselves with family and loved ones….Too often we as teachers forget to enjoy ourselves and relax! The break is going to fly by for us all, and on that dreaded Sunday before returning back to school, most of us will be scrambling to come up with our lesson plans for the upcoming week. 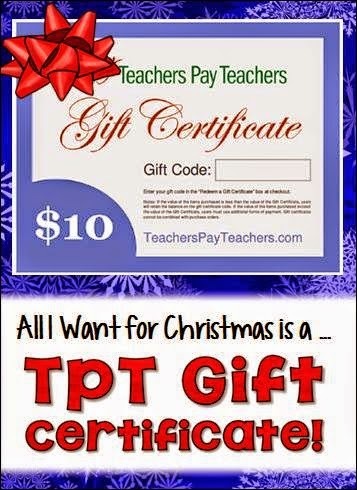 Don't sweat it though, because I will be giving away a $10 TpT Gift Certificate to one lucky follower! You can use it for some top-notch resources upon returning to school, OR gift it to another teaching buddy of yours :) I am linking up with Laura Candler from Corkboard Connections and a BUNCH of other great teacher bloggers who are also giving away a $10 certificate on their own blogs. Be sure to head through the link-up at the bottom of this post and enter each drawing! I'm using Rafflecopter to host my giveaway, and you can earn up to 5 entries if you complete all the items listed. To enter the contest, complete any or all of these entries before midnight EST on December 23rd. Be sure to read the terms and conditions before you complete the entry form. Remember, if anyone asks you what YOU want for Christmas, be sure to tell them that all you want for Christmas is a TpT gift certificate! I sincerely hope your winter holiday is fabulous and that you enjoy time with the special people in your life! Be sure to check your email on December 24th to see if you won! I am enjoying spending time with family who live across the country from us! You have a great banner. Besides teaching, I am a sand collector, so I love to see what people do with the beach themes. Thank you, Kelly! Wow-a sand collector? That's awesome, I haven't heard of that. Do you travel the world? Have you ever been to Hawaii? Spending time with family and baking. Eating Christmas cookies for breakfast! Happy Holidays to you too Emily!! I agree! Enjoy your time with them this break!! :) Thanks for stopping by and entering! My favorite thing is the holiday party with my Kinders...They think everything is so fun at that age!! oh, I bet! I sometimes miss that age but totally like the independence of my third graders ;) Enjoy your break! My favorite things about the holidays are: tree decorating, going to look at Christmas lights, hot chocolate by the fire, and family time! oOoH! I love all of those things also!! Enjoy! I love being with family and watching Christmas movies. Time to spend with family and friends! cinnamon buns on christmas morning! I love spending extra time with my family and this year we have our first grandbaby to snuggle with! Love your Blog design! Thanks for the fun blog hop! My favorite part is relaxing and spending time with my family! I love spending time with my family and relaxing! The endless hours I can spend playing with my kids. I love the time off from work. Love all the family time! I enjoy having my son home from college.